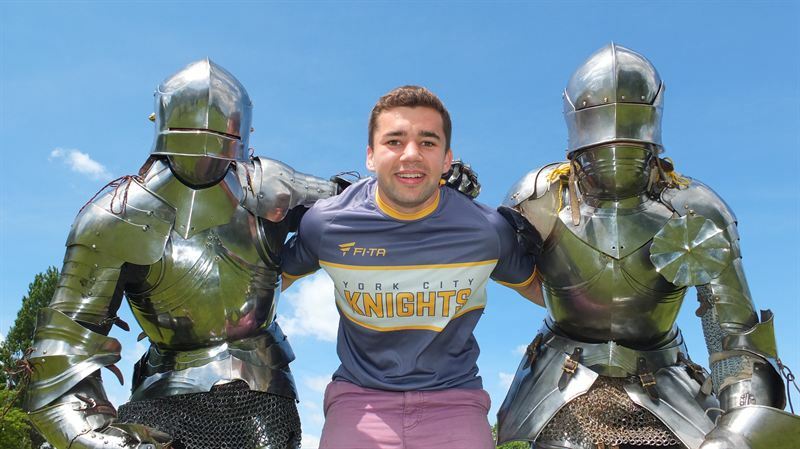 Yorkshire’s medieval knights are training with modern athletes to ensure they have peak levels of fitness for this year’s Yorkshire Medieval Festival, the longest and liveliest celebration of the Middle Ages in the UK. During the four-week festival, there are over 14 days dedicated to the world of the warrior, in a series of battle recreations, combat skills and expert talks and tours. Apprentice knights trained from a young age: from age 7, young aristocratic boys would have been sent away to knightly households – like sport academies – to build physical strength, stamina, balance and co-ordination. Renowned knight Jean II le Maingre spoke of long distance running to gain endurance, and weight-lifting to strengthen arms. Apprentice knights, or squires also had to be expert horsemen: the modern equestrian discipline of Dressage is based on battle training. At the centre of the tournament was the mêlée: fought on horseback and foot, the mêlée was like a rugby grudge match involving up to 3000 knights, spread over several miles and continuing until defeat, exhaustion or darkness took over. Wearing heavy mail vests and armour could add an extra 14 kilos to bodyweight, but by the later medieval period, armour design had become so sophisticated that knights could leap somersaults and mount a horse unaided. Being a knight was akin to Formula 1, involving vast sums of money. Like modern sportsmen, most knights relied on sponsors or patrons to fund their knightly careers. Every aspect of medieval combat is explored during the annual Yorkshire Medieval Festival, now in its third year and organised by the JORVIK group, who also host the annual JORVIK Viking Festival. As well as traditional battle displays, event-goers can participate in medieval combat classes at the Hotspur School of Defence, discover the secrets behind Hollywood choreography, or the graphic reality of injuries caused by deadly medieval weapons. The Yorkshire Medieval Festival 2014 kicks off in Rowntree Park, York on 2-3 August with Medieval Merriment , an extravaganza of knightly combat, living history, and merry medieval mayhem. The full 4-week festival brings together medieval-themed events, activities, talks and tours at various locations in York and the surrounding area, including Pontefract and Knaresborough, celebrating the 500-year period from the Norman invasion until the demise of Richard III and the start of the Tudor era. With the interest in King Richard III this year, the horrors of conflict during the Wars of the Roses are also revealed in the newly-opened Richard III Experience at Monk Bar, and the Henry VII Experience at Micklegate Bar along the city’s historic walls, three landmarks that would have been familiar to Richard III when he visited York during his lifetime. Barley Hall, a medieval townhouse which was home to a wealthy merchant who welcomed both Richard III and Henry VII into York during the late 15 th Century, also makes a fascinating visit, and is the venue for many events during the Yorkshire Medieval Festival. Discounted entry to all three attractions, and also the JORVIK Viking Centre and DIG, can be gained through a special JORVIK Group Pastport available during the Festival. A full listing is available on www.yorkshire-medieval-festival.com.